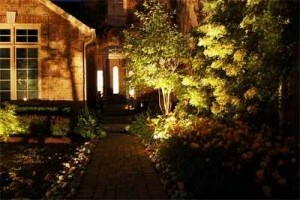 Lighting allows a garden to be used and viewed at night. Thoughtful use of lighting can offer a wide range of possibilities in the garden that just aren’t available during the day. Dark, hidden or forbidding spots can be turned into delightful new features. Daylight penetrates every corner of the garden, illuminating both those things you want to see as well as those you don’t want. However, night lighting can be controlled. It is possible to direct light in a narrow or wide stream, to block its flow, to control its reflection and even to change its color. Night lighting may come from fire (eg. a BBQ, bonfire or lamp), moonlight, solar or electric lights. Often it comes from a combination of sources. Depending on its source the light can throw different shadows and create different effects. 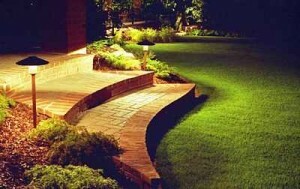 Think carefully about the purpose of outdoor lighting, where you want the light and where you don’t want it, and develop the garden to achieve your aims. If you plan to do a lot of outdoor entertaining at night, you may choose to use”Fijian style lamps” on bamboo stakes and burning citronella oil. This will not only provide a light source, but will also repel insects. However, this type of light is uneven and unreliable in windy conditions. If you want a stronger or more reliable light source you may choose to install some form of electric light as well. Lights should be located to achieve their intended function, for example, so you can see when walking or sitting outside at night, or for visual affect, or perhaps so you can see the garden when sitting inside. If you want to make full use of natural moon light, think carefully about where you plant trees and build pergolas and other structures. What might be a desirable feature in the day time may throw shadows at night making lighting more difficult and expensive; and perhaps creating security problems. Lighting for security has become increasingly important given the increase of burglaries in many areas during recent years. Small jobs can be done by the home gardener by purchasing one of the many garden packs available at garden stores. Larger jobs however may require professional installation and council approval. Always keep records or plans of underground wires and pipes. There would be nothing more dangerous than a spade going through a live wire. Most small garden packs run on small voltages that are not dangerous to humans, however it is still better to be safe than sorry. These are not that common due to the expensive requirement for batteries. 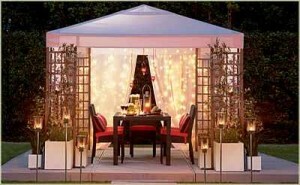 They still may have a use in your garden, such as temporary lighting for a garden party. Each unit runs independent of the next. For this reason they can be placed virtually anywhere without the need of expensive connecting powered lines. Charges using daylight, it doesn’t have to be sunny! 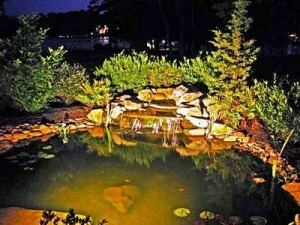 These lights can be placed anywhere and are recharged by the sun – therefore running costs are cheap. They can provide light up to 12 hours, can be moved easily, and in the long run can be cost effective. The illuminance tends to be much lower than electric, therefore a more subtle lighting effect is achieved. 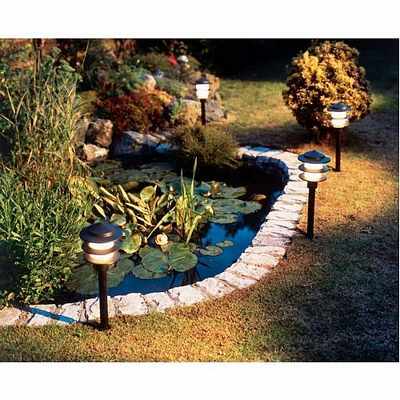 However, the solar power supply can have drawbacks when trying to position the lights in densely planted borders. Even in Spain they need full sun to charge them. Lighting can be permanent (fixed in position) or temporary. Portable lighting can be moved as desired. 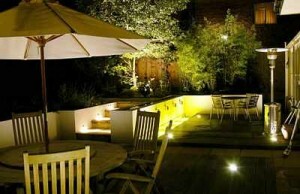 Permanent lighting is most often used for entertainment areas such as back patios, verandas or decking. These systems are generally permanently wired into the homes’ mains system (240 volt) – this type of electrical work should only be done by a qualified tradesperson. The location of the lights is fixed, but the angle at which the light points can be readily altered. The types of lights can also vary considerably, including flood for broad area illumination, spots to illuminate specific areas, and florescent tubes for diffuse lighting. Low voltage units are commonly used in garden areas. These are usually 12 or 24 volt systems for safety purposes. They usually plug into a transformer that is plugged into a mains (240 volt) system. These low voltage systems are designed to be weatherproof. The lights will often be mounted on a spike that can be pushed into the ground to anchor the light. They can also be mounted on walls, trees or even draped amongst plants. Care should be taken to ensure that the low voltage cables are not damaged during gardening, chewed up by pets, or played with by children. It is a good idea where possible, when these lights are placed in a permanent or semi-permanent position to bury the cables. Garden lights are commonly used to illuminate water features, to spot light sculptures or feature plants, to show the way along pathways or drives, to provide broader illumination of garden beds, flower displays, to create displays amongst the foliage of trees and large shrubs (as with Christmas lights), and to provide light in structures such as pergolas or gazebos. The possibilities are just about endless. 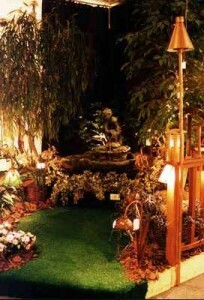 Garden Lighting in Spain allows a garden to be used and viewed at night. Thoughtful use of lighting can offer a wide range of possibilities in the garden that just aren’t available during the day. 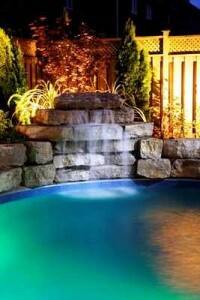 Dark, hidden or forbidding spots can be turned into delightful new features. Spain Info, Garden Lighting. San Francisco De Asis, Urb Marina, San Fulgencio, 03177, Alicante, Spain. 38n21, 0w29.